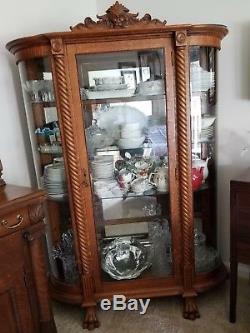 Antique Victorian Tiger oak china cabinet with 3 glass shelves that can be adjusted in the case. Mirrored back to show off precious collectibles. Curved side glass allows viewing from most angles. Claw feet and Lion Head carving give way to the authenticity of the piece. The unit is 16" deep by 48 1/4 " wide by 68 tall. Items in cabinet not for sale. Moving soon and can't take it with me. Owned for over 25 years. The item "Antique Victorian Tiger Oak China Cabinet with Lion Head, Claw Feet and Key" is in sale since Saturday, June 9, 2018. This item is in the category "Antiques\Furniture\Cabinets & Cupboards\1900-1950". The seller is "destinborn" and is located in Panama City Beach, Florida. This item can't be shipped, the buyer must pick up the item.